Join us for the annual Aide To Adoption of Special Kids (AASK) Snowflake Drive. This is an excellent opportunity to give back to kids who are currently in foster care during the holidays. 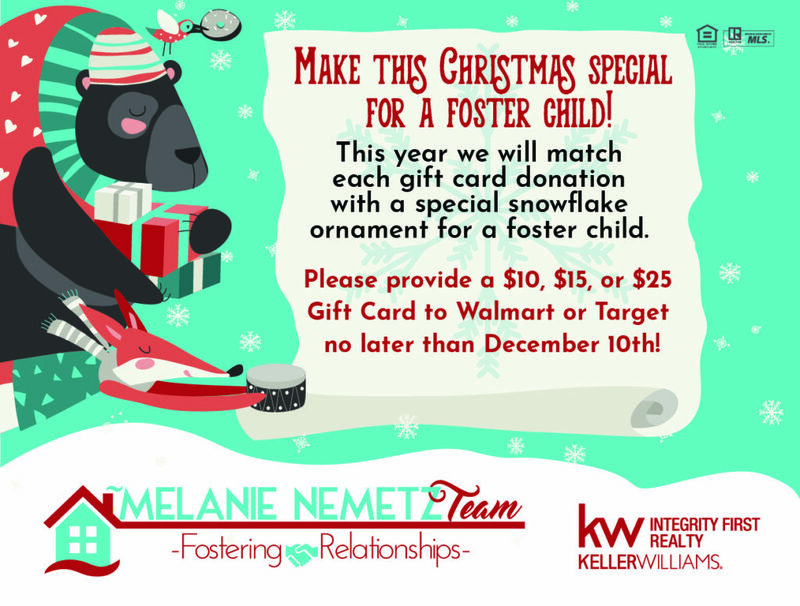 The goal is to provide a $10, $15 or $25 gift card paired with a snowflake ornament, to the 1200 kids placed with AASK foster families. We are collecting $10, $15, and/or $25 gift cards to TARGET or WALMART. We will match each gift card with a snowflake ornament. These will then be provided to AASK in time for their Christmas party for the kids and families. Imagine, receiving a gift at Christmas from someone you have never met. For kids who have been through so much already, this is a highlight for them. Together, we can make this a brighter Christmas for kids in care. How: $10, $15, and/0r $25 gift cards to TARGET or WALMART. We are happy to pick them up from you or you are welcome to drop them off at our office. Our office, Keller Williams Integrity First, is located at the SE intersection of Higley & Queen Creek Rds at 3341 E Queen Creek Rd #109, Gilbert AZ 85297. Please be sure to include your name and the increments on the gift cards. Thank you for helping kids in care! The data relating to real estate for sale on this website comes in part from the Arizona Regional Multiple Listing Service. Real estate listings held by brokerage firms other than Keller Williams Integrity First Realty are marked with the Arizona Regional Multiple Listing Service logo and detailed information about them includes the name of the listing brokers. Listing data last updated 04/18/2019.